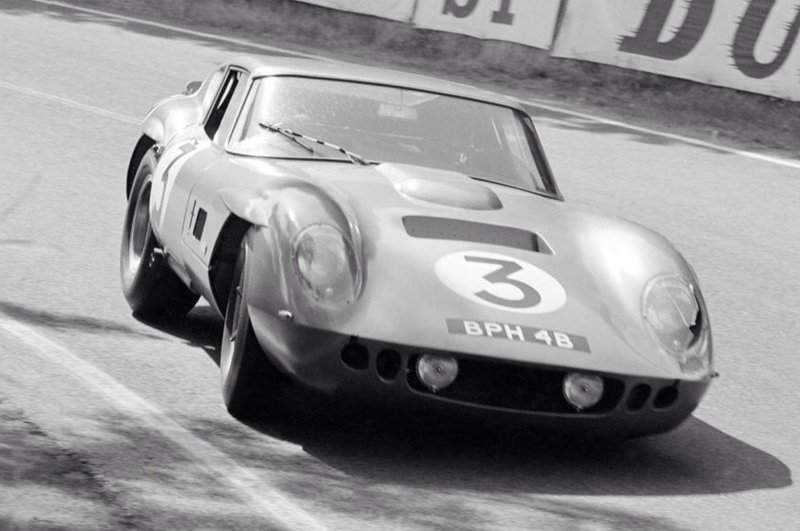 Sears was hoping to do better than his marvellous fifth place at Le Mans in 1963 aboard the Maranello Concessionaires Ferrari 330LMB he shared with David Piper. 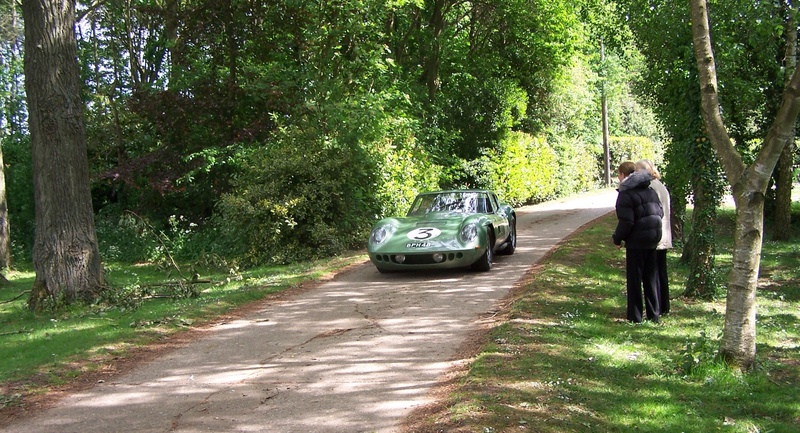 The talented British sedan and sportscar racer was partnered with Peter Bolton in the one of a kind AC Cobra Coupe, AC Cars Ltd owner Derek Hurlock and his team built to take on the ‘works’, Shelby Daytona Coupes in the famous 1964 24 Hour classic. 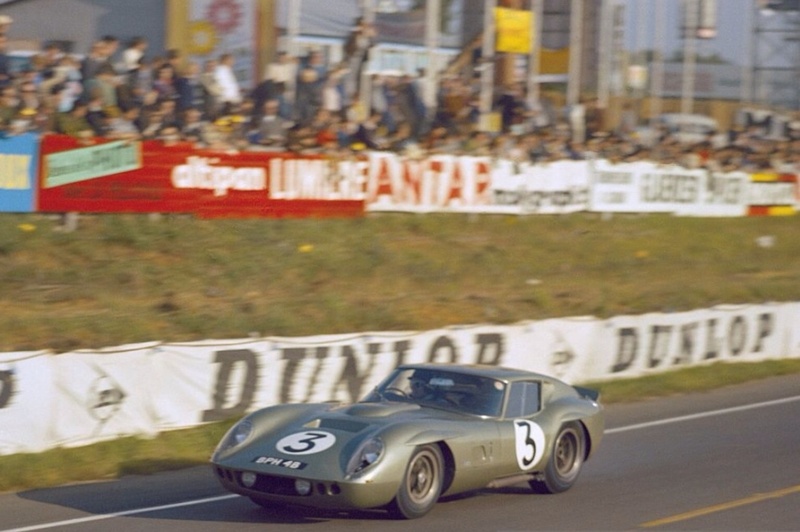 It was also a chance for AC to improve upon its 7th place finish at Le Mans in 1963 when the factory Cobra driven by Ninian Sanderson and Peter Bolton finished 7th. 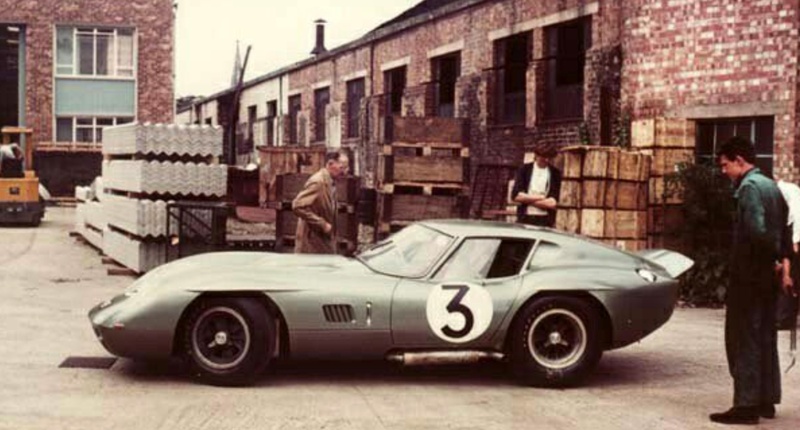 The big Coupe was registered ‘BPH4B’ to allow some testing on public roads, despite this the first Carroll Shelby knew of AC Chief Engineer Alan Turner’s in-house design was at the car’s competition debut during the Le Mans test day in April. 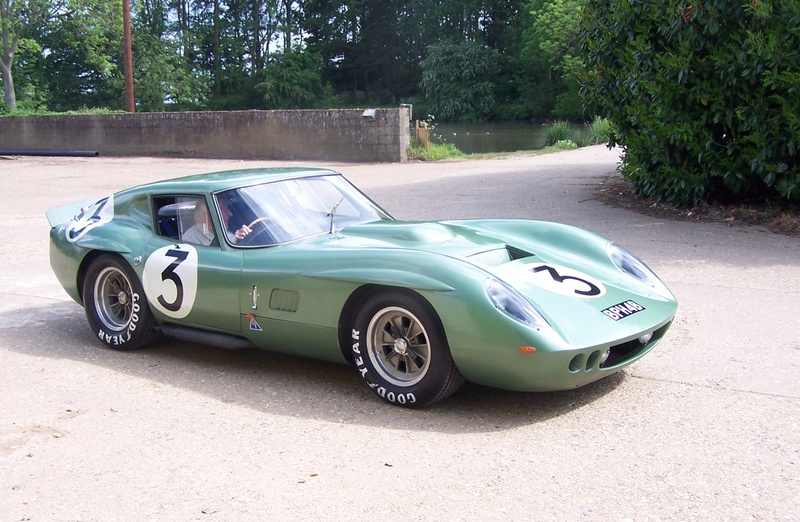 Visibly lower than the Pete Brock designed Daytona coupe (41 inches compared with 48 inches- its height a function of uncertainty over Le Mans windscreen height regs) both designers sat the drivers lower in the car. Turner had also raked the windscreen, created a lower nose section and a longer flowing roof as well as designing the ‘eyebrows’ over the tops of the wheel arches he claimed help clean up airflow. The cars promise of speed on the Mulsanne Straight was met- Bolton achieved the 27th fastest time in a fast run without ‘going for a time’ in a car which still required development. 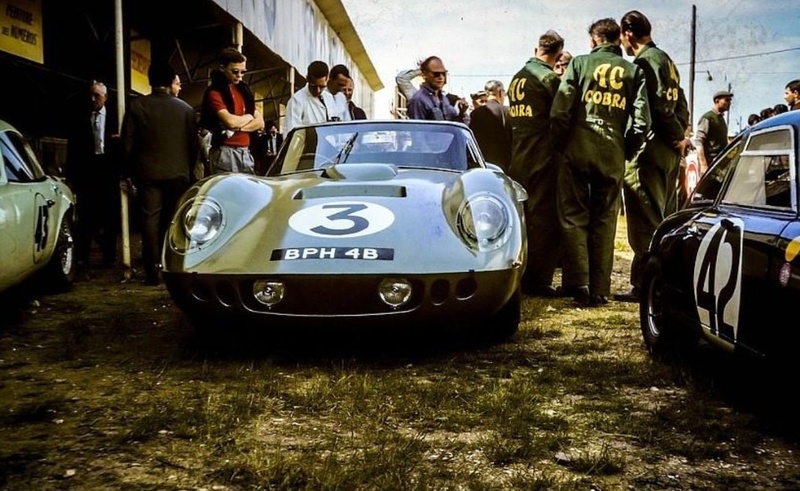 During Le Mans Sears and Bolton were timed at 180.2mph @ 6300rpm, matching the Daytona Cobras despite giving away 30bhp to the Shelby entries- AC cars chassis #A98 had a 289cid/4.7 litre ‘Windsor’ engine which developed circa 355bhp, the Shelby cars had around 385bhp. The car qualified conservatively second in class behind the Gurney/Bondurant Shelby entry and ran in that race position, at one point leading the class early in the race averaging 20mph for the first 3.5 hours. The big coupe began to have fuel feed problems which were found after the race to be caused by newspaper in the fuel tank- sabotage- which blocked the fuel filter. Much time was lost as the filter blockage was diagnosed and remedied. Circulating at the pre-race determined lap times the next stint was trouble free with the slippery machine able to match the Shelby’s top speed despite less power and a higher diff ratio (2.88:1 rather than 3.09:1- the fastest Daytona speed of the weekend was 186.4mph @7000rpm using the 3.09 ratio). It was an unusually bitterly cold night for mid-summer with occasional patches of mist. Some reports have it that the teams tyre supplier advised not to change the cars tyres. At around 10.15pm on Saturday evening, with Bolton at the wheel a tyre blew at Maison Blanche- the car spun and was collected by Giancarlo Baghetti’s following works Ferrari 275P. The Ferrari speared off into the barriers and crushed three French, late teenaged spectators standing in a prohibited area. The AC flew over the guardrails, lopping branches from trees at a height of 20 feet before coming to rest in a crumpled heap. Baghetti was uninjured with Bolton taken to hospital with minor injuries. The best placed of the Shelby Daytona Coupes was the Dan Gurney/Bob Bondurant driven car which qualified 10th and finished 4th. Sears qualified his machine 13th, the Jean Guichet/Nino Vaccarella works sports-prototype Ferrari 275P 3.3 V12 won the race that year. The wreck of Coupe A98 was brought back to the AC headquarters in Thames Ditton and never rebuilt and or raced further ‘in period’. 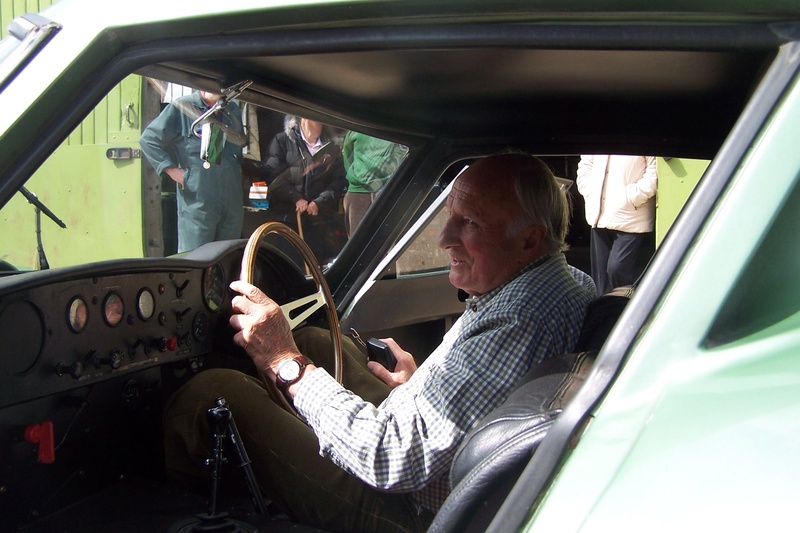 The very significant car was restored by Barrie Baird who negotiated its purchase in 1972. The work took over 12 years, many of you will have seen it at Goodwood and the like. The high speed excitement about the AC Coupe started in much more amusing fashion, although it wasn’t seen that way at the time, not long before Le Mans. 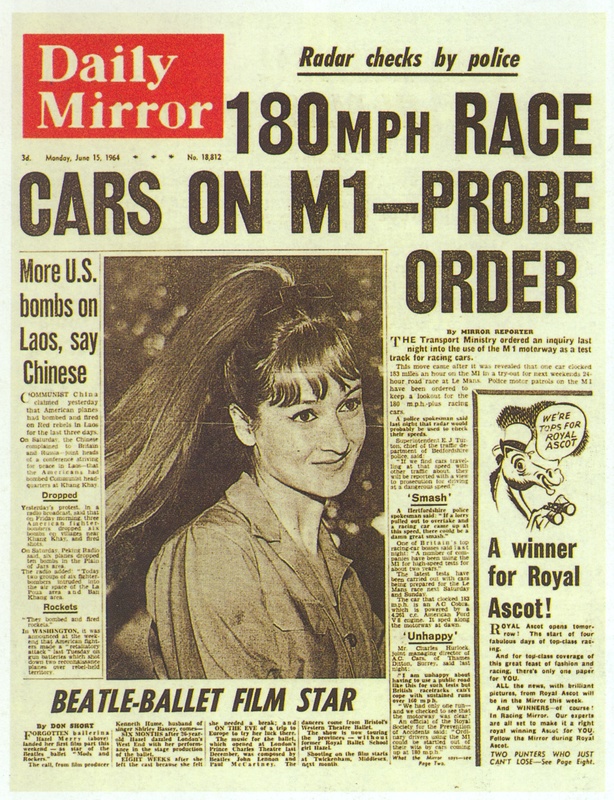 Given the Motor Industry Research Association (MIRA) roads had not allowed a flat-out run AC decided to test the high speed stability of the car on Britain’s M1 motorway in an incident which has gone down in motoring lore. ‘Gentleman Jack’ Sears recalled the early morning run in articles published in ‘The Car Connoisseur’ and ‘Autocar’ magazines. Not too long after Le Mans Sears stopped racing to return to farming in Norfolk but he was still very much in demand as a test and development driver, but a monumental accident in a sports-racing Lotus 40 Ford at Silverstone came way too close to costing him his life, aged 35. It took him 12 months to recover but he never strayed far from racing, not least because his son David became a racer and team owner. In sequels to the M1 incident the publicity was very good for AC Cars, but the compulsory 70 mph speed limit introduced on British roads in 1967 was sheeted home to the exploits of AC and Jack! Three shots from ‘The Cobra-Ferrari Wars’. Top-the Coupe body framework being constructed at Thames Ditton. Middle is the engine bay with the Weber 48IDA fed, cast iron, 355bhp pushrod 4.7 litre ‘Big Henry’ V8- what a marvellous race engine this ‘Windsor’ family of small block Fords is! At the bottom is Jack Sears alighting the car after THAT M1 morning run. A day after uploading this article ‘A98’s owner and restorer Barrie Bird kindly got in touch and added hugely to this story with some comments which are at the end of the piece in the readers comments area. He also sent in some wonderful material, which he is sharing with us all- the first photos are ‘…ones of Jack on his farm and you can see the little farm roads which were traversed for half an hour or so at three figure speeds’. What a mess! 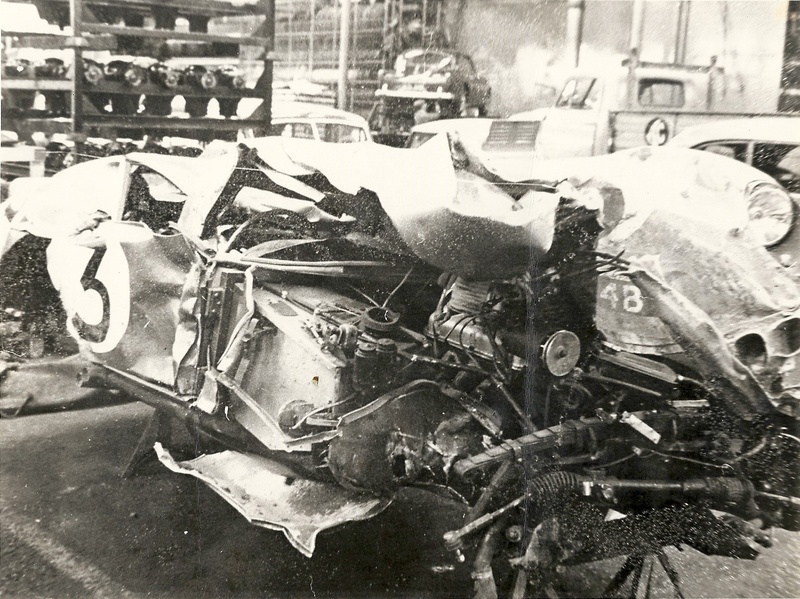 A98 post Le Mans shunt- Peter Bolton was a lucky boy to escape with his life. The top front suspension leaf spring, steering rack, tank and a rocker cover are about all of the components I can pick. ‘Apart from the body not much different to the production roadster, but Alan Turner certainly got the aerodynamics right.’ And so say all of us, it is a glorious motorcar. Brilliant read – a totally different era when talented, brave men went racing. That is a stunning car not slow either. Blown tyres must have been a pretty regular occurance. Frightening @ 170-186 MPH!!! Stunning machine and a shame they did not build more- perhaps pressures were brought upon them not to compete with Shelby seeing they were all in the family. Fantastic car- sports racers of the sixties hard to top visually! An interesting and accurate read, thank you. A little confusion on chassis configuration and overall height: Neither A98, the A.C.works coupé nor any of the Shelby Team or Willment Team Daytonas had the main chassis tubes altered from the standard road car layout – if they had then the car would have been ineligible for GT racing. In the Daytona the driver sat on top of the tube, as in the road car, but in A98 Alan Turner moved the driver outboard of the tube so he could sit 3″ lower. That accounts for some of the height difference, but as I understand the Pete Brock philosophy he wanted the windscreen roofline interface to be very smooth and so carried a rising profile back to a point above the drivers head. This might also have had the effect of moving the centre of lift forward and away from the tail. I doubt this theory worked on either count as the Daytonas had to introduce a spoiler on the tail to minimise lift just the same as all the fast GT cars did at the time. There is also the the case of the Daytona which the Italians built ‘wrong.’ Just as Frank Costin found, with the aerodynamic version of the Maserati 450S which he was commissioned to design, Italian panel beaters had little respect for Anglo Saxon designers and felt free to ‘improve’ the bodies during building. When they first built a Daytona Pete Brock’s carefully planned arcing roofline was ignored and a flatter roof panel was fashioned with a sharper change of profile where it joined the windscreen. This machine was no slower than the other Daytonas with the correct roof. Why was only one A98 built ? Well the whole accident took a lot out of Derek Hurlock, remember three French lads were killed – yes they had climbed a fence and were lying in the grass right beside the track and yes it was a Ferrari that ran over them, nevertheless it was A98 which instigated the fatal accident. The intention had been to build a batch of 12, but I don’t think Mr. Derek’s heart was in it any more. Why did the tyre burst ? Well it simply wore through. At the last pit stop A.C. expected a tyre change, but it seems that the Goodyear rep. said it was not scheduled and not needed. At the time Goodyear were just starting to make a mark in International racing, was it just inexperience, especially of le Mans ? 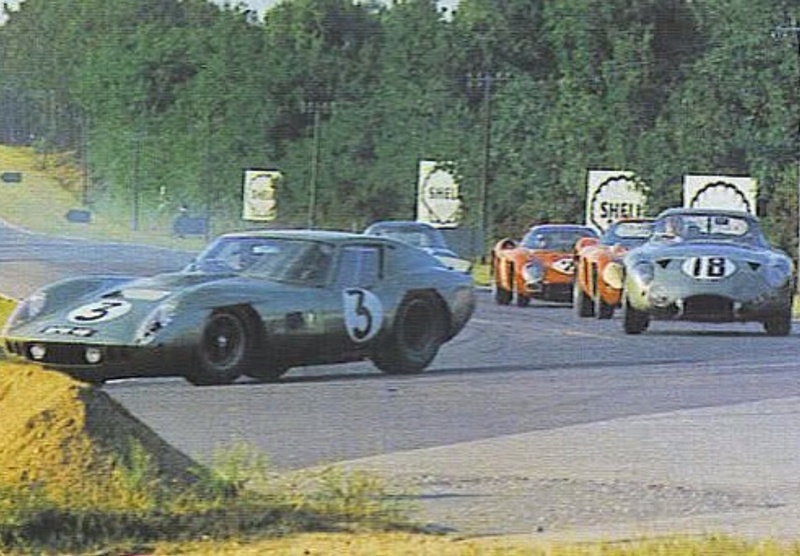 During the night the Neerspach/Amon Briggs Cunningham entered Daytona was disqualified and the next morning, in daylight, long time Sales Manager at A.C. Jock Henderson and Shelby Chief Mechanic Phil Remington were looking at the car when Jock pointed to a rear tyre on the Daytona – it was nearly worn through. Thanks so much for such a comprehensive response, you have added to the accuracy and completeness of the article bigtime. I understand why AC reacted the way they did to the accident, such a shame. I would be intrigued to read Jack’s comments about the relative merits of the three Coupes, no doubt they are in a publication somewhere? Yes Jack Sears did comment on the relative merits of the various Cobras he raced. Back in 2011 we reunited Gentleman Jack with A98 on his farm in Suffolk. That is a whole story in itself. Simon Taylor was there and wrote it up (at least the parts which could be published) for ‘Classic and Sports Car’ September 2011, including Jack’s comparative opinions. One anecdote Jack related opened my eyes to the difference between us ‘drivers’ and ‘real racing drivers.’ He explained that A.C. took two patterns of tail spoiler to le Mans and he was delegated to test them so as to choose the most effective. This he duly did running a few laps with each and making a choice. However some Bright Spark then pointed out that there was a third configuration which should be tested: No spoiler. Jack duly went out with no spoiler and arrived at the kink near the end of the Mulsanne straight where, as we know, the speed would have been over 180 mph. A98 went in to a spin as soon as the steering wheel was moved. Somehow, during a very long moment, the car failed to collect any scenery and Jack drove back to the pits no doubt ready to share some pertinent information with the aforesaid Bright Spark. Fantastic story! I imagine somebody like Frank Gardner (I’ve got the ‘Castrol’ biography of him) could have written a couple of books just on ‘My Experiences as a Test Driver’! Happy to include a swag of shots of the cars restoration too if you would like- just give me a detailed caption- I’ve no word limits so ‘go the Doctor’. That “newspaper in the fuel tank- sabotage- which blocked the fuel filter” thingie bugs me, because there’s no further reference. It’s quite something, any further news on that? I will send you some photo’s. 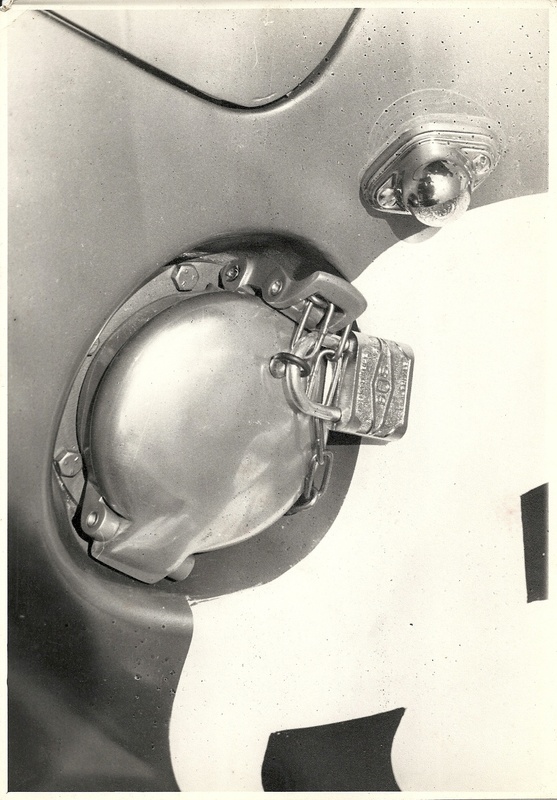 So far as the paper in the fuel tank incident goes it was perhaps not entirely unexpected: There are some contemporary pictures, shot at le Mans, shewing A98 with substantial chains and padlocks attached to the Enots fuel filler caps. The only clue I can find is in some reports, emanating from the Shelby Team, who had a similar experience with paper in a Daytona fuel tank earlier in the year at Spa. One of their team members, recently hired, was suspected and he was sacked after le Mans. No further incidents were recorded. Some sort of Munchhausen syndrome ? Rather like the rare case of Firemen who cannot resist starting fires….. Thanks for all the further info, Barrie!